Dr. Thelma Meléndez de Santa Ana (Ph.D. '95) was confirmed as Assistant Secretary for Elementary and Secondary Education for the U.S. Department of Education. She had been serving as superintendent of Pomona Unified School District, and was recently selected to be California's nominee for the 2009 American Association of School Administrators (AASA) National Superintendent of the Year. She was chosen by the Association of California School Administrators or ACSA. Dr. Glen Thomas (Ed.D. '95) was appointed to California Secretary of Education by Gov. Arnold Schwarzenegger. From 1998 to 2006, Thomas served as executive director for the California County Superintendents Education Services Association, the statewide network of 58 county superintendents of schools, and in that role he worked closely with Dr. Rudy Castruita and Dr. Stuart Gothold. Dr. David Marsh also chaired Thomas' dissertation, which focused on state leadership in math education across six states, and the two also worked together on a number of state policy initiatives, including the California High School Exit Exam (CAHSEE) Task Force. Dr. Manuel Baca (Ph.D. '98) was appointed by Gov. Arnold Schwarzenegger to the 17-member California Community Colleges Board of Governors, which sets policy and provides guidance for the system's 72 districts and 110 colleges. Baca has worked as a dean, vice president and interim president at Rio Hondo, where he is a full-time tenured faculty member teaching political science, business management and business law. Dr. Marine Avagyan (Ed.D. '08) has presented her dissertation research on "California's Induction Policy" to the National Staff Development Council's Summer Conference in Boston. She also presented her research at the Delta Kappa Gamma - Chi (California) State Convention, an annual event for the International Women Educators' Society, in May. 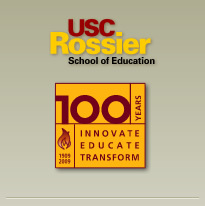 ©Copyright 2009 USC Rossier School of Education. All Rights Reserved.